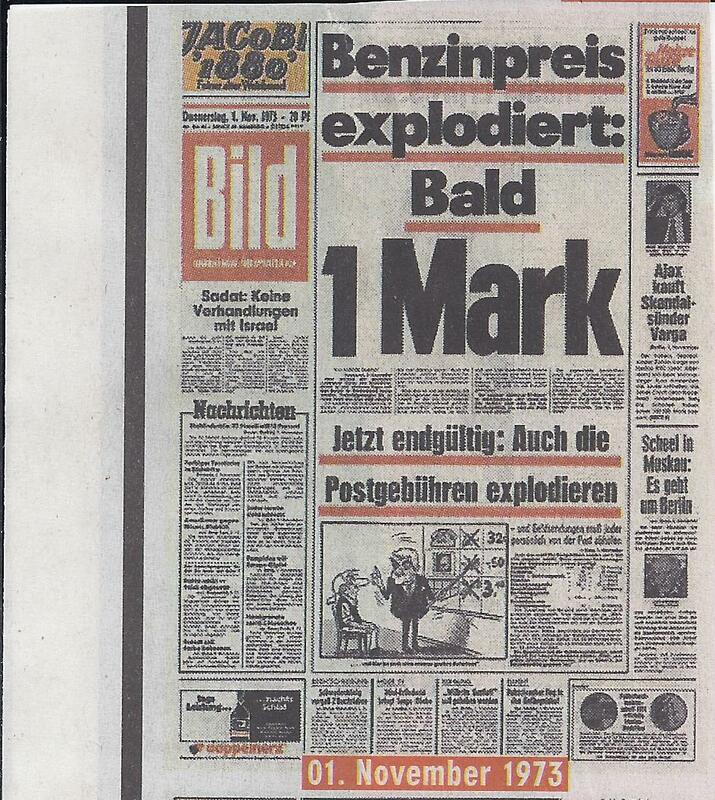 Benzinpreis explodiert: Bald 1 Mark! The famous German newspaper Bild celebrated its 60th anniversary last weekend by printing a special edition which was delivered free of charge to every household in Germany. Today, I got around to reading it. There was one double-page spread where they printed title pages from various months throughout its 60-year life of notable events (such as a German becoming Pope, the attacks of 11 September, the moon landing, etc.). 1 mark for a litre of petrol (US$ 2.45 for a gallon at today’s exchange rate)… that’s something that people can only dream about nowadays. On the other hand, I remember as a child people chanting, “Allah ist mächtig, Allah ist stark, der Liter Benzin kostet bald 2 Mark!”, which seems very expensive back then, but even that level is quite a while ago; nowadays, prices are more than 3 marks (which would be €1.53).